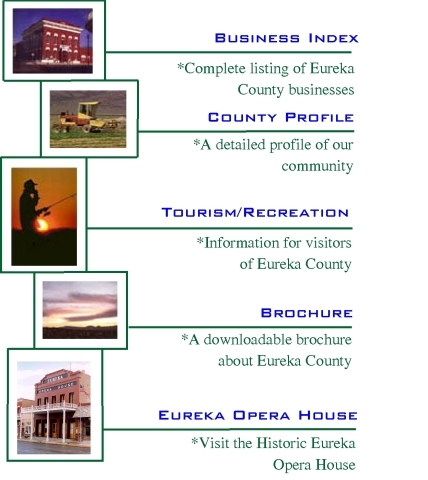 This is the Eureka County Economic Development Homepage. This site contains a business directory with information about various services such as retail trade and agriculture, as well as information about motels, RV park accomodations, and recreation for tourists. The profile has detailed information about our community, and we are in the process of developing a downloadable brochure about the County. Business activities in Eureka County are mainly argriculture and mining-based, although all entreprenuerial activities are welcome. With flexible zoning ordinances, very low property tax, and no business licensing, Eureka County is an attractive place to do business. If you like high desert air, stunning mountain views, and no traffic congestion, you'll love Eureka County! NOTE: The Brochure is available in Adobe PDF File format (390KB); you can read it online or download and print the document (6 pages - includes data tables and color photos).